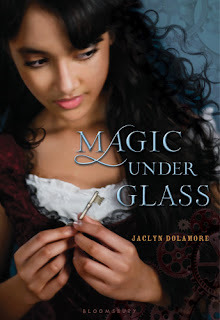 Jaclyn Dolamore is the author of Magic Under Glass, the newly released Between the Sea and Sky, and the upcoming Magic Under Stone and Dark Metropolis. Though set in a fictional world, her Magic Under series takes inspiration from real historical settings. The obvious answer is, of course, stories set in the past with a fantastic element. My stories don't take place in our actual past, though. Although strongly influenced by settings, mores, etc., of earlier eras, they remain in made-up worlds. So are they true historical fantasy? And does that mean that high fantasy that takes place in pseudo-Medieval lands is also historical fantasy? HMMM. Clockwork Angel was a ton of fun. Megan Whalen Turner's books are wonderful and like nothing else out there. 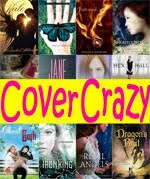 And although it's not out until February, Jessica Spotswood's Born Wicked is a great read, with lovely writing, strong female characters and cute boys--everything a book should have, basically. In April, the sequel to Magic Under Glass is finally coming! There will be adventures in the fairy lands, a new impossible-yet-possible romance, and plenty of Nimira and Erris of course. And in summer of 2013 comes Dark Metropolis, about a city full of creepy secrets and a girl looking for her missing best friend, based on 1920s Berlin, with all of its decadence and darkness. Dark. 75% is perfect. And fair trade if I can possibly afford it! Never say never, but, straight contemporary with no speculative elements would be hard for me. Aside from your own, who is your favorite mermaid? Twitter style: I’m in love with a winged guy, but I’m a mermaid. Your dating advice on how to make it work in 140 characters? Invest in island real estate! Twitter style: I’m in love with an automaton. Your dating advice on how to make it work in 140 characters? Thank you so much for stopping by, Jackie! Have any of you read Magic Under Glass or Between the Sea and Sky? 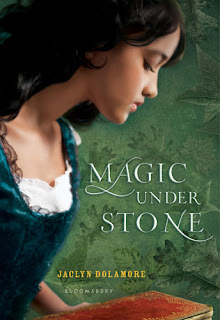 I can't wait to see what happens next for Nimira in Magic Under Stone. And what about you, what advice would you give to a girl and her automaton boyfriend or a mermaid and her winged guy? I don't think I can top Jackie's advice! Check out the blurb for Jackie's latest release Between the Sea and Sky! For as long as Esmerine can remember, she's longed to join her older sister, Dosia, as a siren--the highest calling a mermaid can have. When Esmerine takes her siren's vow, she means to protect the sea and all that live within it--until Dosia runs away to the mainland and Esmerine is sent to retrieve her. Secretly thrilled with the prospect of seeing a world that she's only glimpsed from the ocean, Esmerine uses magic to transform her tail into legs and journeys to the capital city. There, she comes upon a friend she hasn't seen since childhood--a dashing young man named Alander, who belongs to a winged race of people. Alander, whose odd ways and brash opinions offend yet fascinate her. But as Esmerine embarks on a search for her sister that will take her farther away from the sea she loves and the life she has always known, she and Alander rekindle a friendship...and more. 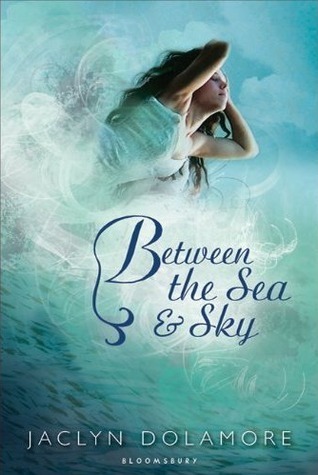 Bloomsbury is generously providing a copy of Between the Sea and Sky for giveaway! 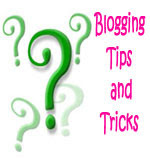 Join Ruby today as she chats with one of our favorite authors and offers up another book for giveaway! Fun interview, Small! I already have Jacqueline's books on my tbr pile and would to own a personal copy. I look forward reading Between the Sea and Sky! It looks and sounds interesting and I haven't read a mermaid book in a long while now. :) It's time! Born Wicked does sounds good. I mean, hello cute boys? I'm sold. lol. I hadn't realized she was the other of Between Sea and Sky too, I kind of just associated her with the Magic Under stuff. Great interview and thanks so much for the chance to win! I've really been wanting to read Between the Sea and Sky! Great Interview! I have this one so I'm not entering. I just finished Born Wicked today and if she loved it as much as I did, I'll have to read her other recommendations. After checking with you first, of course! Angie, Hope you enjoy it! 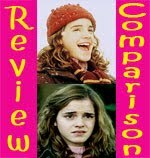 Alex, They are different in both style and subject, but I liked both her books. Thank you! Holly, You're welcome! Good luck! I have heard such wonderful things about this book. That was a fun interview.